The latest radio ratings came out this week, and CBC Radio One is congratulating itself for one of its best ratings periods ever. On closer look though, it seems that, like every other radio station in the world, there’s a fair bit of selective fun with numbers going on. 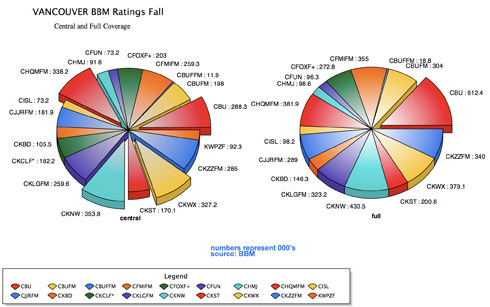 CBC Radio cleaned up in the latest audience measurement report released by BBM. In Toronto, CBC is high-fiving for becoming “number one” for the first time ever. CBLAFM are the call letters of Toronto’s CBC flagship – and it scored a 9.4 share in this round or ratings. 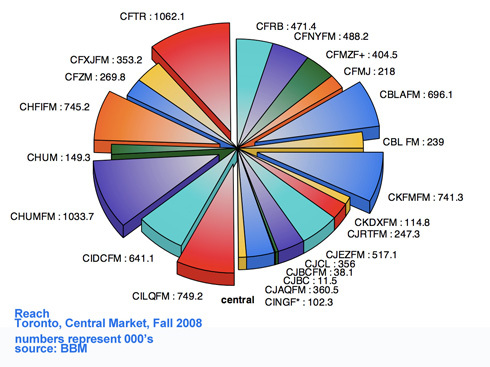 BBM defines share as “total hours tuned to that station expressed as a percentage of total hours tuned to all radio” in the market. That’s great of course, but there are some in the broadcast industry who think very little of share. Mostly because if your listeners keep their radio tuned for long period of times, your share will be higher, even though a competitor may have more listeners. In other words, how many people are actually listening. Within CBC, making Toronto local radio a winner is a huge deal – and for any of my former colleagues who are celebrating this weekend, good on you. But when you look at CBL’s reach, whether in the central market (i.e. the city) or full coverage (the entire broadcast range), it’s far from number one. 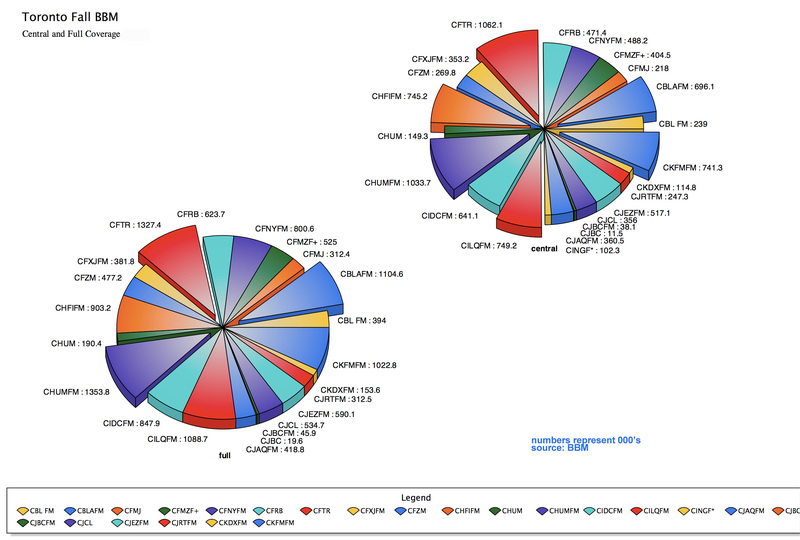 And in the central area of Toronto, CBL does less well. With 696,100 listeners, they’re in 5th place. In Vancouver, it’s a slightly different story, and very different numbers. Unlike Toronto, CBC Vancouver won’t be using share to claim number one spot – that’s because in share they’re second, well behind CKNW. What does make Vancouver CBC number one is a great technical infrastructure. Their full coverage reach is an awesome 612,400 listeners, thanks to excellent transmitter coverage across the lower mainland. This is miles ahead of their closest competitor – and their closest full coverage reach competitor isn’t news/talk station CKNW, but CFBTFM – better known to you as The Beat. 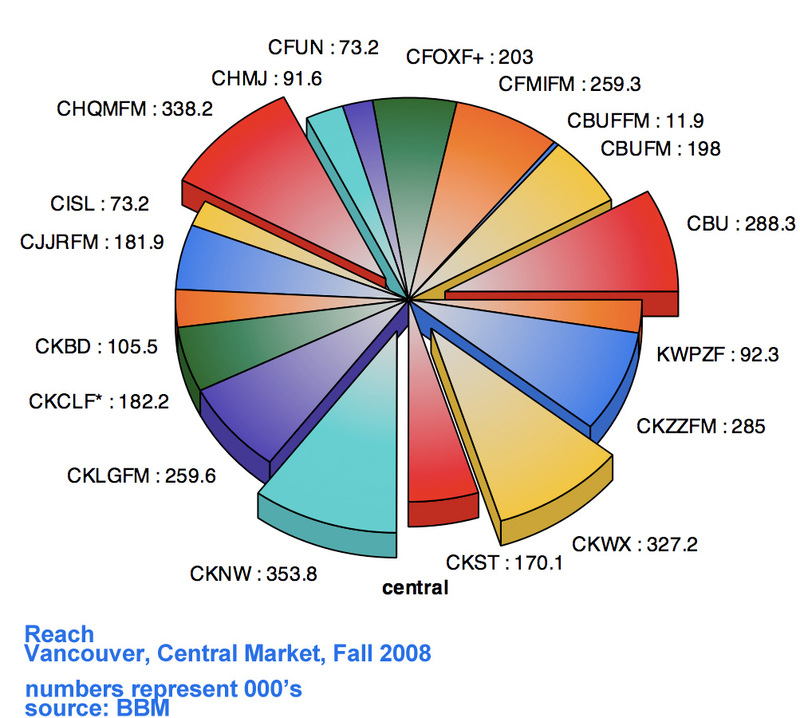 When it comes to the Vancouver central area however, the numbers go quite differently, with CBC well behind CKNW, CFBTFM, CHQM and are on par with CKZZ. In Vancouver central, CBC Radio One is actually 4th. What does it all mean ? CBC Radio doesn’t currently sell advertising so they can claim #1 all they want, but when the radio sales teams from private stations hit the street to sell, CBC isn’t even on their chart. Internally – it means everything, particularly as CBC eyes the current government cuts with apprehension. You just had to listen to Heritage Minister James Moore interviewed on CBC Vancouver this week to hear how big a concern it is for CBC. Speaking to him about the government’s financial plan, on no other question did they push him for an answer except for one – will CBC be getting cut. When minister Moore didn’t answer the question directly, they went on to ask it 2 more times. The other issue for CBC surrounds CBC Radio Two. With massive changes to the schedule last fall, the ratings are not looking good. So having a great story to tell about CBC Radio One will go a long way to deflecting the heat on Radio Two’s poor performance. The full BBM highlights are online and summary level information is a free PDF dowload, so have a look and make your own charts and graphs to show how your station in #1, in something. I’ve got a couple of other charts you can take a look at. Like those above, click for a larger version.